This is about as total a break from the figure skating coverage as I can manage, I think. My first experience in Finland was as an exchange student in 1988–89. I had not been back to the country (or indeed to Europe at all) until my trip last month. I can’t claim that I was ever particularly fluent in Finnish, but the exchange agency did arrange for a Helsinki University lecturer, Eugene Holman, to give our entire group a joint lesson in the basics of Finnish-for-foreigners: most importantly the phonetics, but also big chunks of noun and verb morphology. Finnish uses subject-verb-object order in clauses, like English and many Indo-European languages, but it shares with fellow Uralic languages (like close relative Estonian and more distant cousin Hungarian) a much more elaborate noun case system and, of course a vastly different base vocabulary — most of which I had forgotten in the 28 years since I left in the spring of 1989. Finnish also has some oddities that are not exactly rare, but don’t occur in English or most other IE languages: vowel harmony (certain vowels “go together” in words, which is reflected in changes to case endings) and consonant gradation (when a word’s shape changes in certain ways, the final-syllable-initial consonant can change length or quality, or in some cases drop out entirely). Anyway, that’s a very long and involved introduction to a few things I noticed about language and culture on my return visit. I should be careful to note that these are not necessarily language changes, just things that were particularly noticeable to me after a 29-year gap when I was exposed to virtually no Finnish language or culture — I might not have noticed them before, or might have forgotten (see also recency illusion). I’m going to present these in the reverse order of how I noticed them, because that’s the order of increasing technicality, so if you get bored, it’s OK to stop before the end. I mentioned above that Finland is officially bilingual. This version of bilingualism extends to public education and local government services, in places where the minority-language population is non-negligible, and to national government services everywhere. 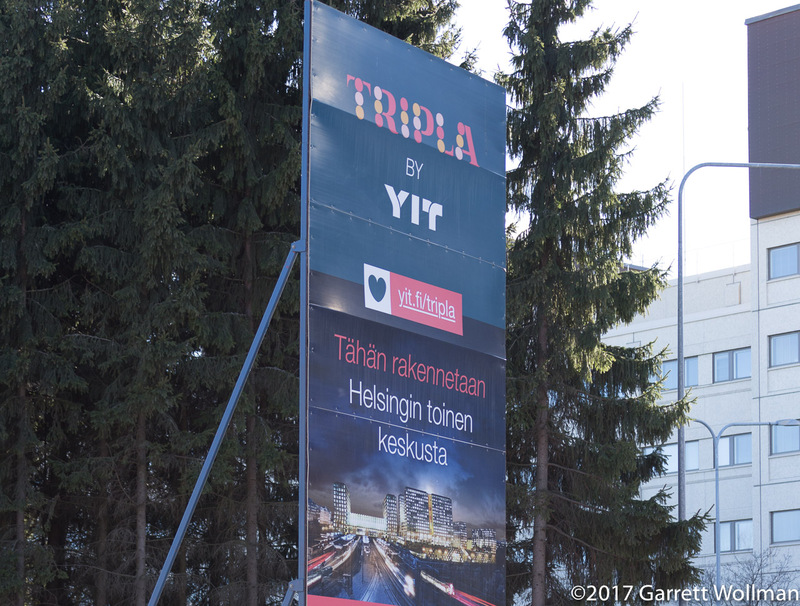 Helsinki meets the threshold to provide services in Swedish, and traffic signs, street signs, tram and bus stop names, are indeed given in both languages. Place-names in particular often differ; Helsinki itself is Helsingfors in Swedish, but some differ far more — probably only a local could be expected to know that Pasila, på svenska, is Böle, although once you learn that, to go from “Länsi-Pasila” to “Västra Böle” is less of a stretch. But that’s all government and public services: commercial Helsinki is, to a very large extent, also bilingual — but Finnish and English, not Finnish and Swedish. 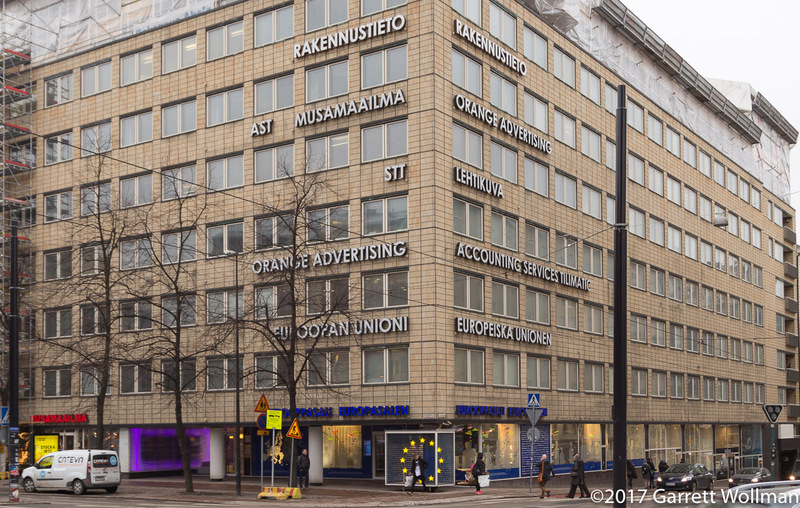 The European Union has offices in this building, located at Malminkatu 16 in the Kamppi neighborhood of Helsinki. Note the EU signage in Finland’s two official languages, accompanied by monolingual Finnish and English signage for other tenants. Now, it’s certainly the case that as Finland’s capital city and its international gateway, you would not be surprised to see a lot of English used in Helsinki by the hospitality industry — hotels, trains, taxis, and the like — and other places where visitors are expected to congregate, like the convention center. But the opening and modernization of the Finnish economy, since EU accession back in the 1990s, has brought a great deal of international business to Helsinki, and the working language of most multinational businesses is English. (Even back in 1989, the Finns I knew were fairly fatalistic about this: they knew full well that nobody else was going to learn their language, and the state made third- and even fourth-language instruction mandatory from an early age.) Expansion of university education and research meant hiring faculty and staff from other countries, and here again, English long ago surpassed German as a lingua franca. And finally, the EU’s policy of free movement has meant that both educated professionals and unskilled laborers have the ability to migrate from their home countries in search of jobs in high-wage northern Europe. My hotel’s housekeepers were speaking English when I passed them by in the corridor, and so were the German and Swedish professional men discussing vacation homes at the table next to me in a fancy restaurant. (And the menu at that fancy restaurant? English first, then Finnish — no Swedish, even though the proprietors have obviously Swedish names.) Even the signs outside foreign embassies tended to be in English rather than Finnish or Swedish (or the foreign country’s native language). In fact, the only international institution that seems to go out of its way to use both Finnish and Swedish in Finland is the European Union itself, as shown in the photo above — and of course that’s a treaty requirement. All of those uses are of course “international” in some sense. What I found even more notable was the extent to which English text cropped up in signage, business names, and advertising messages that were clearly created by and for native Finns — something which I don’t remember seeing at all in 1989. The photo above is a really trivial example: using the English word “by” in the sign isn’t required, and it’s the only text on the sign that isn’t either Finnish or Swedish — but it gives an “international” flair, I suppose, and it also avoids having to deal with the fact that Finnish and Swedish grammar would require very different-looking texts here, so it offers some notion of “neutrality” that the rest of the sign (mainly Finnish with some Swedish text in smaller type) does not. During my time as an exchange student, most of my Finnish-language exposure was from people — teachers, fellow pupils, TV newscasters — who were attempting to enunciate clearly and in proper Standard Finnish, and this contrast was always quite evident, even though I had difficulty hearing some of the other important contrasts like vowel length. In this visit, by contrast, since I wasn’t watching the TV news or attempting to make conversation in broken Finnish, most of my exposure to the spoken language was passive, from people sitting around me in the arena or on the train. And here I noticed that the a/ä contrast did not seem to actually exist, at least for unstressed syllables (like in kyllä, “yes”) or in the diphthong äi (like in ensimmäinen, “first”) — the a/ä in both cases seemed to be turning suspiciously schwa-like. My Finnish colleague tells me that this is widespread in the spoken language today, and a similar leveling can be observed for the vowel-length contrast and also for consonant “length” as well, but that if the speaker is asked (or primed) to enunciate, all three contrasts come back. The third row is a bit controversial, especially with the inclusion of the partitive case; it’s arguably a bit shoe-horned in, and certainly it doesn’t show the same sort of sound patterns as the other two rows, but it’s what I was taught back in 1988. The first two rows are all that are relevant to this discussion, though. This entry was posted in Language, travel and tagged bilingualism, Finland, Finnish, Helsinki, Russia, vowel harmony. Bookmark the permalink. Thank you for this interesting post. I enjoyed it with full heart. I am Finn, who is an ordinary person, without education. My interest in languages started very late, actually, when I stated to blog. Now when making my posts in many languages, I have noted that Finnish has something similar with other languages. For example, Finnish words “akku” and “hai” are same in German. Finnish “sata” in Sanskrit is “sata”. I have also noticed some similarities in Portuguese and French, but at this moment, I do not remember those words. When I worked in Finnair, there were a pilot whose interest was similarities between Finnish and Quechua. He published them from time to time in company’s magazine. I remember that he found more than 100 similarities. In many cases, pronouncing was similar, not written. At those days, I did find this interesting. If I remember correct, those words were old words; I mean normal living words which man used in “historic” days. Matti. There are actually many similarities between unrelated languages that are regarded by linguists as spurious. It is also possible (even common) for unrelated languages to borrow from each other; Finnish has borrowed a lot of vocabulary from Germanic over the years, mostly Old Norse and modern Swedish in the past, but lots of words from English in recent years. Finnish grammar is sufficiently different from any Indo-European language, however, that it’s very easy to tell when an English (Swedish, German, etc.) word is being borrowed and when it is simply being used as a foreign word — loanwords act grammatically like native nouns/verbs/adjectives and generally have alterations to make them phonetically and morphologically compatible with Finnish. Mark Liberman reposted part of my commentary above at Language Log and the much more knowledgeable commenters there had a lot of interesting things to say about point 3 above, including connections with the issue (in English) of when country-names are treated as arthrous (requiring articles) or not. Go ahead an read the comments.